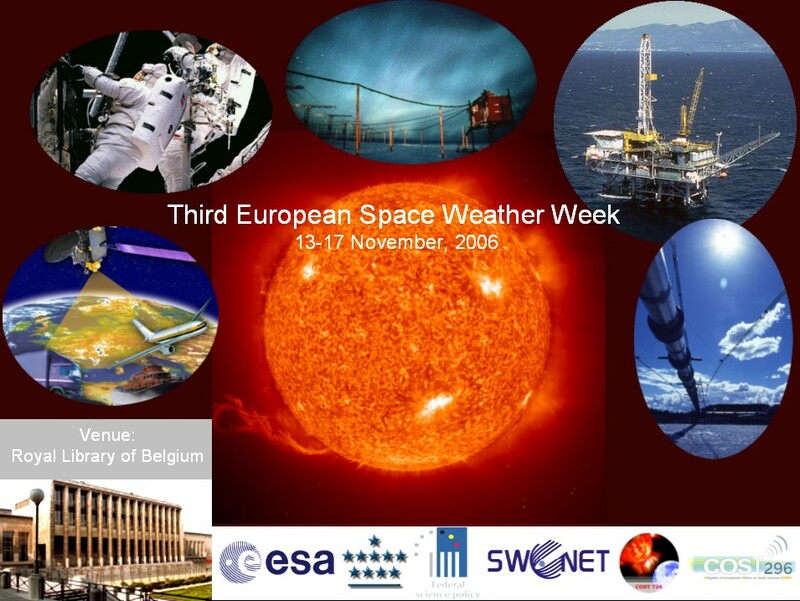 The next European Space Weather Week will take place at the Royal Library of Belgium, Brussels, from Monday 13th November to Friday 17th November 2006 . This meeting is jointly organised by the Solar Influences Data analysis Center (SIDC) at the Royal Observatory of Belgium (ROB), ESA, the SWWT, the COST 724 and COST 296 communities. The local organisation is done by the SIDC. This event will build on the advances made during the first two European Space Weather Weeks held at ESA/ESTEC in 2004 and 2005. The workshop will again adopt the central aim of bringing together diverse communities working on all elements of space weather. This year’s meeting will discuss hot topics and recent advances in both scientific and applications based domains. It will also focus on a number of topical thematic issues from both a scientific and applications oriented perspectives. New tools and techniques will also be discussed and demonstrated during the workshop with a view to aiding the transition between new scientific results and space weather services. The meeting will also explore community development and investigate possible routes towards the creation of a sustainable space weather activity in Europe through a dedicated session and several business meetings.